Want to find someone ? Google or Yahoo does not provide your required people result ? Don’t worry go for Pipl.com. 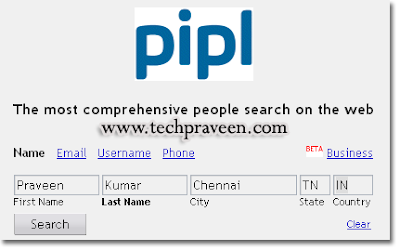 With Pipl you can find a lost relative, an old flame, a classmate or a business contact – but if you are using a search engine such as Google or Yahoo to search for people, you have probably realized by now that it might work in some cases but in most cases it won’t. How come the best search engines fail so miserably when it comes to people search? The answer lies in a little known but very important part of the web called “the deep web”.Also known as “invisible web”, the term “deep web” refers to a vast repository of underlying content, such as documents in online databases that general-purpose web crawlers cannot reach. The deep web content is estimated at 500 times that of the surface web, yet has remained mostly untapped due to the limitations of traditional search engines. Since most personal profiles, public records and other people-related documents are stored in databases and not on static web pages, most of the higher-quality information about people is simply “invisible” to a regular search engine. Deep Web robots are set to interact with searchable databases and extract facts, contact details and other relevant information from personal profiles, member directories, scientific publications, court records and numerous other deep-web sources. Pipl is not just about finding more results; we are using advanced language-analysis and ranking algorithms to bring you the most relevant bits of information about a person in a single, easy-to-read results page.